I seldom share on the financial results due to a lack of time and inexperience in looking through financial statements/results. 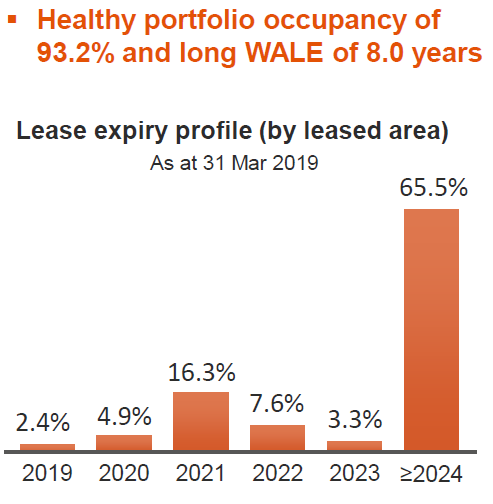 Here are some takeaways I had from Keppel DC Reit First Quarter 2019 Financial Results which was released on 15 Apr 19. Please DYODD. I am vested in this stock. The gross revenue has increased by 26.4% to $48 million. 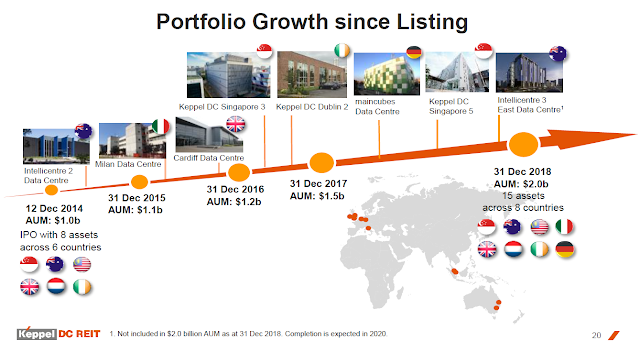 More importantly, the distribution per unit (DPU) has increased by 6.7% to 1.92 cents compared to last year, mainly due to the contributions from its new acquisitions of maincubes Data Centre in Germany, and Keppel DC Singapore 5. I am always thankful and appreciate it each time DPU increases. It is the hard work of the trust manager and its fore-sight. Many a times, we take it for granted that DPU is to remain the same or increase. If you want a case of decreasing DPU, go look through Sabana Reit’s DPU from the period of 2011 to 2015. Currently, Keppel DC Reit overall occupancy level is 93.2%. While majority of its data centres are at 100% occupancy level, there are a couple which is pulling the overall occupancy level down. The main two data centre dragging it down are the Basis Bay Data Centre in Malaysia and Keppel DC Dublin 1 in Ireland whose occupancy levels are 63.1% and 61.8% respectively. Keppel DC Dublin 1 occupancy level has actually improved slightly. Last year, its occupancy rate was 56.6%. But then, they have shared that the low occupancy level was because that data centre was an old asset. This was the reason why asset enhancement is being carried out at the site to improve energy efficiency. Hopefully, when this is completed in 2020, the occupancy level will increase. As for Basis Bay Data Centre in Malaysia, the occupancy level used to be 100% until 2017 when it dropped to 63.1%. Back then the site was fully occupied until the master lessee downsized its operations from three to two floors. Since then, the Reit has not been able to lease out the remaining floor. - Demand for data centre is expected to remain strong with internet of things, 5G mobile network, and autonomous vehicles and machines. Basically, everyone and everything is consuming data these days. Its aggregate leverage (gearing) is at 32.5%. This is below the regulatory ceiling of 45% which means that the reit can still embark on more acquisitions without the need for rights issue depending on the size of the acquisition(s). Currently, 81% of its borrowings are hedged at a fixed rate while the remaining 19% are tied to the Floating Rate. Its NAV is $ 1.05. Do note that it is currently trading above its NAV. Keppel DC Reit ’s property portfolio has grown from $1 billion to S$2 billion since its inception. Although there was a rights issue then in 2016. Personally, I think that the management has done quite well in growing the portfolio. While there will always be room for improvement, I am not one to take the growth in stock value (NAV), DPU and stock price for granted. Hopefully, the management can continue their track record and bring Keppel DC Reit to new highs. I had a queue order to sell NetLink NBN Tr for several months. As I mentioned in my post in Jun last year, I was going to hold it for a short duration only. In fact, I held it longer than expected. I was surprised that the queue order was fulfilled just a day before the financial result was out as the share price was nowhere near $0.795 then. Personally, the recent rise in share prices was surprisingly given the fact that the manufacturing growth (Purchasing Managers' Index) has been slowing down for the past 5 months. Also, several corporate results were not ideal, yet the share prices rose. In the meantime, I am looking at accumulating more shares such as Keppel Corp and FLT since I have a pool of money from selling off NetLink NBN Tr. Hopefully, my GTD orders get fulfilled. Dividends are recognised after ex-dividend (xd) date. Average dividends per month is calculated by dividing the dividends received by 12 months regardless of the month.